My Cat Eats Too Fast! How Can I Get Kitty to Slow Down Eating? It’s not healthy for cats to scarf down their meals. Eating very quickly can lead a cat to vomit up his or her entire meal soon after finishing, and let’s be honest, when cats eats a whole day’s worth of food in 2 minutes flat, there’s no way they’re getting the kind of enjoyment out of their meal that could be had if it took them a little longer to polish off their plates. If you have a cat that eats way too quickly, you’re part of a pretty big club! It’s not at all uncommon for cats to eat incredibly quickly, even if there’s absolutely no need. But there’s always hope: training your cat to slow down his or her eating is possible. I’ve managed to do it over the years with my cat Avery, who was a voracious fiend about dinner time when we first took him in. 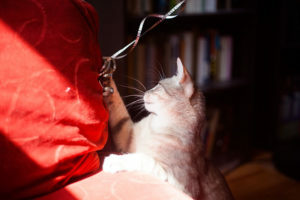 And even before you get to the stage in the game where your cat is slowly eating on his or her own, adding hindrances that force your cat to slow down while eating meals is quite easy to implement, and the effects of a slower pace of chowing down are reaped right away. Kibble or wet food – whichever you use makes absolutely no difference. You can force a speedy eater to slow down his or her pace very easily no matter which type of food you’re giving out at mealtimes. Some of the following tips are wet food specific, some are dry food specific. Most are relevant to both. 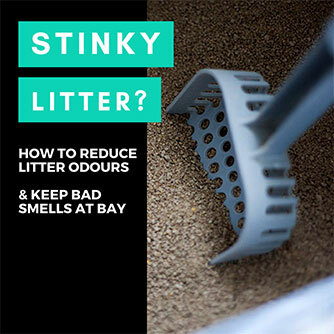 You can use a combination of these tips, or (like me) stick to using just your favourite one (#2 for me). Either way, over time, your cat should adapt and become a little more slow of an eater. Eventually of course! As these things really do take time. 1. Put a couple golf balls into your cat’s food bowl. 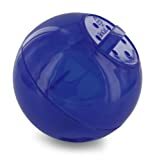 This may sound strange, but putting golf or ping pong balls into your cat’s food bowl after you’ve filled it with your cat’s food for the meal will make it incredibly difficult for your cat to eat quickly. Ping pong and/or golf balls act as obstacles that your cat will have to push out of the way before he or she can get to the food beneath. In essence, doing this is like DIY-ing a cat feeding toy. Be sure to leave enough room for your cat to get his or her full face in to eat the cat food, and have the rest of the bowl covered in balls (you might need 2-3 in there depending on the size of your bowl). Alternatively, you can simply buy an inexpensive slow feeder cat bowl that will do the very same thing: make it very difficult if not impossible for your cat to eat very quickly, since there are obstacles between your cat and the meal in the bowl. 2. Use a slow feed pet bowl or a cat feeding toy to serve meals to your cat. 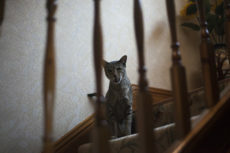 Avery was a stray/feral cat in our neighbourhood who my husband Thomas and I took in. When we first brought him home, especially considering how very little food he’d had access to previously, he pretty much binged on any food we’d give him, snacks or meals, and couldn’t for the life of him slow down when food was put down. Our solution? We bought the Catit Senses Food Maze and started putting his entire meals into it. The feeding toy was a little difficult for him to get used initially, but being motivated by hunger, he found his way around the doodad quite quickly. At his fastest, he can polish off a whole day’s worth of food in 20 minutes when it’s put into this food puzzle. Nowadays, however, he’s slowed down his eating a lot, and usually takes around 40 minutes to polish off an entire day’s worth of food – just because he doesn’t feel the need to hurry. This toy has definitely helped us encourage him to slow down eating considerably. I never expected him to eat slower than he was physically capable, especially considering those first few months we had him, but he has all thanks to this awesome gadget. Feed your cat wet food rather than kibble? You’re more likely to find slow feeders like the Wangstar Pet Slow Feeder Bowl linked to above helpful. Think these won’t don’t slow down your cat down enough? 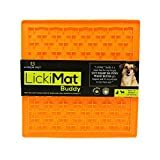 You may want to try the Hyper Pet Lickimat Feeding Plate instead – while it’s more or less a slow feeder meant for dogs who eat wet food, based on reviews it seems to work wonderfully for cats as well. 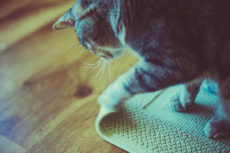 And since you’re able to pat down the wet food (tip #4 on this list – head there for an explanation as to why this works) in combination with some “obstacles” to eating, I can’t imagine a better concept for a slow wet food feeder to be based on. Want to look through a bunch of slow feeders to see if there’s a better product out there for your cat? Check out my article listing as many slow feeder cat bowl varieties as I could find. 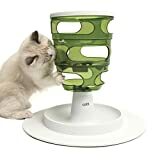 There are actually also a few puzzle feeding toys that play nice with wet food and dry – in case you happen to feed both. One I’ve stumbled across is the Trixie Activity Fun Board, which I reviewed here. The Fun Board takes a mix of wet and dry food, so if you feed both, it’s pretty ideal. There are plenty of other puzzle feeders if neither of these happens to strike your fancy. 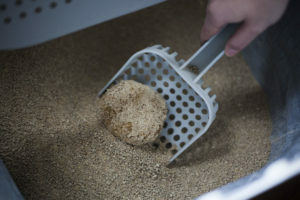 Some come in the shape of balls your cat can run after (my mom uses this one religiously to feed her cat meals), or even tunnels your cat has to dig in to get food out of. 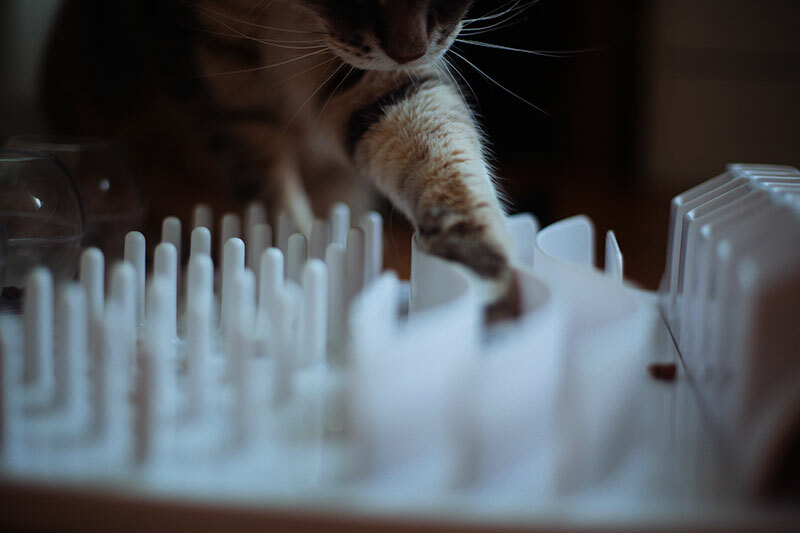 If you like the idea of having multiple toys to keep your cat challenged in different ways, you can always alternate between different feeding toys that you’re a fan of. It all goes a long way in keeping cats entertained and stimulated, especially when they live primarily or solely indoors. I’ve seen some sites that recommend staying away from feeding meals to your cat through these puzzle feeders. Their advice is based on the fact that some cats will not finish their meals if they are put into puzzle feeders, and thus that they could lose weight to an unhealthy degree, which is obviously not ideal. But if you make sure to monitor how much cat food is left in the toy after your cat is done with his or her meal, and your cat happens to be polishing off every last piece of kibble or every speck of wet food in the feeding toy, I can’t see how this would be a problem. 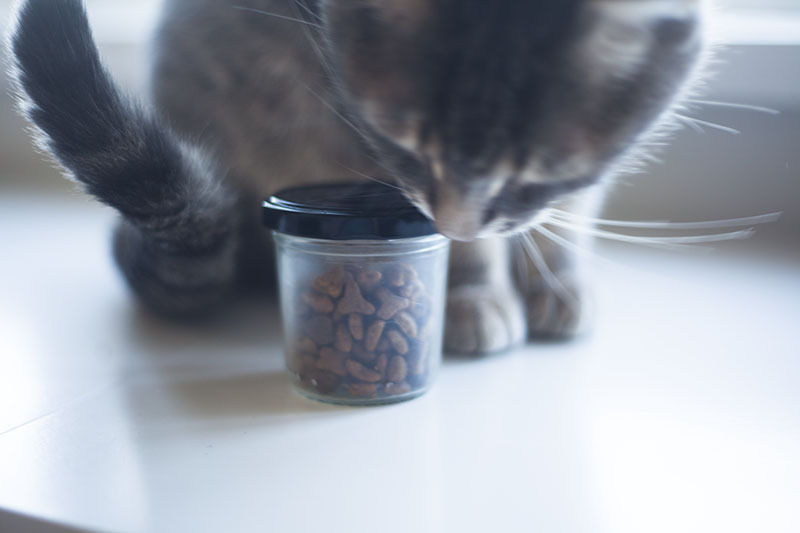 If your cat is leaving food uneaten, however, go back to feeding meals, or try a different cat puzzle, one that’s easier for your pet to get food out of. 3. Have your cat do a kibble-inspired workout session right before meals. My cat is a particularly lazy cat who definitely does not get enough exercise on his own. To make sure he does some sort of half-decent physical activity during the day, I use kibble to “inspire” him to work out before meals. The exercise routine is outlined in full here, but the gist of it is that I have him jump from one high object to the floor, then up to another high object (say from a chair to the floor to a sofa or bed) over and over until he starts looking like he’s getting a bit tired. Why does this help slow down his eating? While he jumps from one spot to the next to get kibble, he’s eating much more slowly than he would ever if I were to simply place a bowl in front of him. On top of that, by the time his workout is done, his tummy isn’t completely empty, and there’s also been enough time for his body register this fact. This means he doesn’t have that “I’m starving!” feeling quite as badly as if he were to start eating his meal on a completely empty stomach. That same “My tummy’s too empty, I’m starving!” feeling makes us humans want to scarf down as much food as possible as quickly as possible, I’m sure it’s the same for cats. Either way, Avery will typically slow down eating at least a little bit after these workout sessions, something I’m very happy about. 4. Using Wet Food? Pat the Food Down to Make It Dense Before Serving. I don’t use wet food, so I haven’t tried this out myself, but I’ve seen this tip circling around online and it makes sense that it would work. 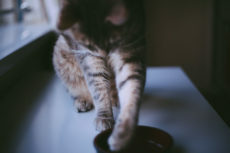 If you use wet food and you pat it down, compressing it considerably more than when it was in the tin, your cat should eat the wet food a lot slower than if it’s loosely placed in a bowl. Why? 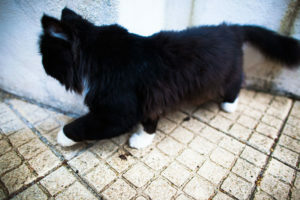 Cat’s shouldn’t be able to just bite and swallow food that’s compressed to that level; instead, a cat should have to lap and lick at the food in order to eat it – which means the meal will take a considerably longer period of time to polish off. 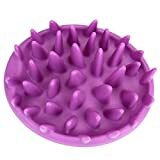 As I mentioned when talking about feeder toys for wet food in tip #2, the Hyper Pet Lickimat Feeding Plate makes use of this idea, but also combines it with obstacles that should make eating even slower for a cat, so if you try patting down your cat’s wet food at home and it works, but you still want your cat to eat even slower, you may want to give this feeder toy a shot. Have you ever tried patting down wet food? Does it work to slow down your cat? Let me know your experiences in the comments section! 5. Split up meals. Feed 2-3 times a day (or more!) instead of once. It’s perfectly fine to feed your cat once a day if it works for both you and your cat. 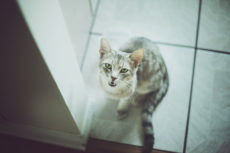 Just keep in mind that if you’re feeding your cat only once a day, scarfing down meals might have something to do with the fact that your cat feels pretty hungry by the time mealtime rolls around. Would prefer to feed quite small amounts frequently, but end help doing this while you’re away at work? 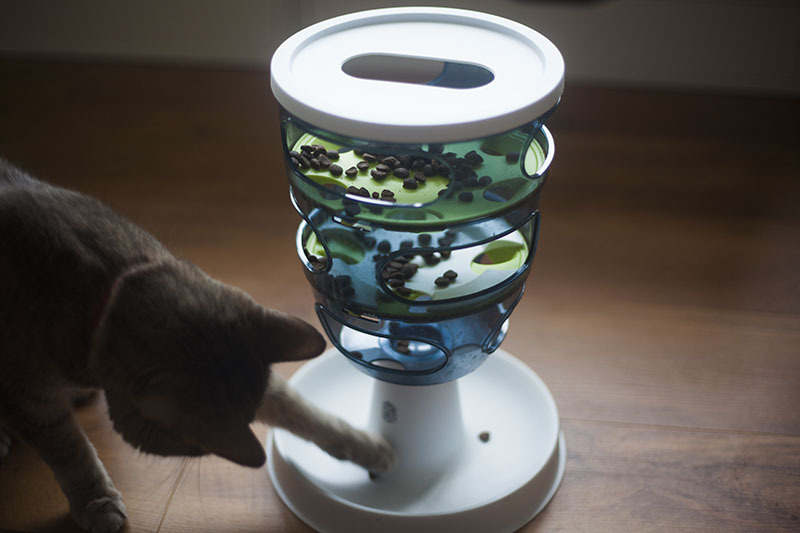 Try a timed pet feeder out to see if that does the trick. Only give out one meal per day because you’re worried about your cat gaining weight? Feeding a pet multiple times a day rather than once can be really tricky when it comes to keeping track of how much food he or she’s been given, but if you use this simple trick, you can prevent overfeeding permanently, and give away treats and snacks all day if that’s what you’d like to do. 6. Add water to your cat’s kibble or wet food. In all likelihood, this won’t dramatically help your cat to eat slower, but it will help at least a little bit. 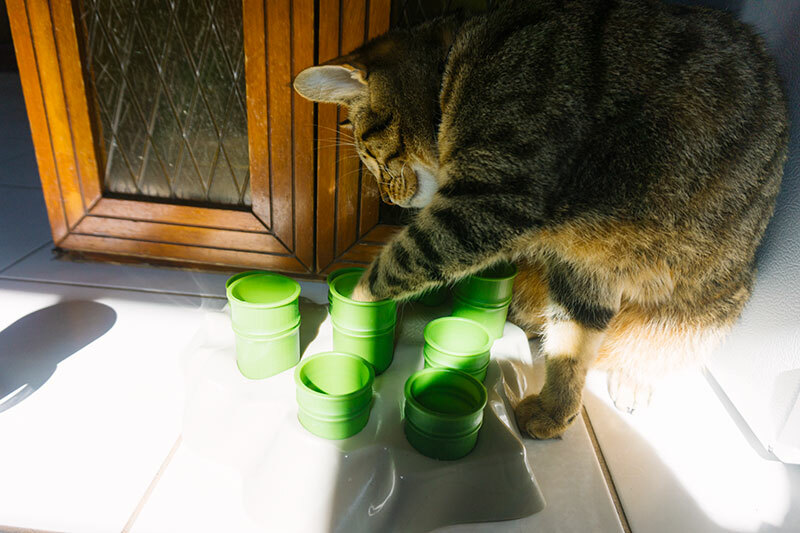 Adding water to your cat’s kibble or wet food means he or she will have to get through a lot more, quantity-wise, to polish off what’s in his or her bowl. 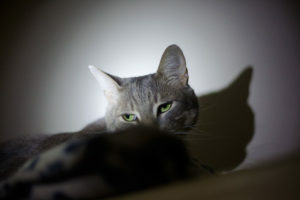 Even if your cat starts off eating just as quickly as usual, chances are he or she will need to slow down at least a little by the middle to the end of the meal, especially considering all the water going into his or her system that will really help give your cat a feeling of getting full. 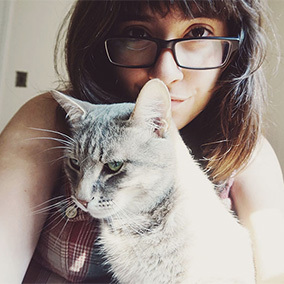 This technique is a considerably good one for helping cat owners whose cats get UTIs often, or who have the potential to become dehydrated because they don’t drink much water. If your cat happens to be like this, check out these surefire tips to get your cat to drink more. I once cat-sat for a friend whose family asked me to add water to his cat’s kibble every night. His cat didn’t mind the “mushy” kibble at all, and lapped up all the kibble flavoured water quickly before getting to munch on his kibble. While his family asked me to do this solely for the fact that he simply didn’t drink enough without this technique, I did notice it had the positive side effect of making him eat considerably slower by the time he got to his kibble. How Would You Recommend Slowing Cat Eating Down? Does your cat happen to eat very quickly? Ever known a cat who eats faster than the wind? Have you ever tried to slow a cat’s eating down? What technique did you use and did it work out? What advice do you have for pet owners whose cats eat at the speed of light? Would love to hear your thoughts in the comments down below! Thanks for the tips! I just got a new kitten, so one of my older cats feels it’s now necessary to scarf down his food before the kitten comes to bother him. I’ve tried feeding them in separate rooms, but he was still wolfing it down and throwing up 2-3 days a week. I’m going to try the ping pong ball thing with his wet food, as well as the communal dry food bowls. Thanks again! Poor thing, I really hope the ping pong ball trick works perfectly for him – let me know how it goes! Nothing helps. In her mind, she’s dying of hunger 24/7/365 and subsequently inhales her food (kibble and wet) in 0.3 seconds (0.6 if I increase the amount). Then about an hour or so later, vomits repeatedly. I have no idea what else to try to help her. Maybe a part of the reason she’s always hungry is because she’s vomiting often? 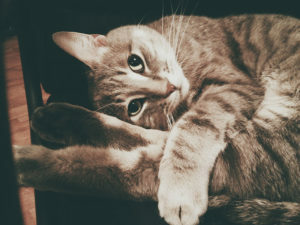 You could try out a sensitive stomach cat food (these are some of the post popular of those) if you think the issue might be related to stomach acidity and not just eating too quickly. 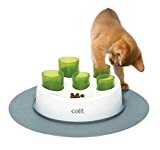 To stop the vomiting if it is from her eating too quickly, get the Catit Design Senses Food Maze. 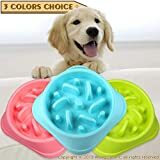 It’s a really good food toy because, based on my experience, cats can’t get food out quickly enough to eat so fast they vomit. 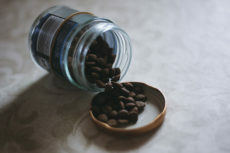 Feed all meals and snacks in it, starting out by giving little snacks maybe once every hour or two. Once the vomiting is dealt with (the worst of the problems, I think), time to deal with the next issue – the pangs of hunger. I once accidentally picked up some of Royal Canin’s diet cat food by accident (I bought it because it was duck based and hadn’t realized it was a diet kibble at all) and found this type of cat food *really* helped Avery feel fuller. I didn’t feed it by itself because he obviously does not need to lose weight, but after giving a meal or snack in a kibble feeder, I’d put a small handful of this out and it would really help Avery not feel the pangs of hunger until the next feeding. Then there’s the issue of maybe accidentally having trained your cat to beg for food (I’ve certainly been there). I actually have an article up here about that and how you can un-train this behaviour. The best system for this is to have consistent feeding times that are a maximum of 2 or 3 times a day. Set an alarm so kitty gets used to alarm = food, no alarm = no food, and it should help considerably. I’d try all methods one at a time in this order to see if anything sticks. 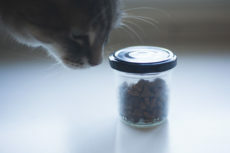 Training (including training to become used to meals rather than begging to be fed snacks all day) takes a minimum of a week or two to take proper effect, so let’s say you tried feeding your cat two or three meals a day with no snacks, make sure you stick to this routine for at least a few weeks – maybe even a month – before confirming it isn’t working. Let me know if any or all of this helps or if you’ve tried any of these things to no avail. And good luck! Thanks for your advice :). Agreed about the puzzle feeders being double the goodness with their ability to help cats slow down & entertain in 1! Wow, marvellous ways to get me to slow down, except I eat rather slowly and delicately. I know that’s weird, but mama is really considering the ping pong ball thingy. SO smart. Where do you get such good ideas? Thanks for tips that may come in handy for me one day, since mama is starving me to get me skinny (just kidding…she cut back 10 g of food temporarily) and I’ll be attacking my food soon!!! I think I saw the ping pong trick in a YouTube video once! It’s a really interesting way to get kitties to slow down, I agree! I just feed small amounts over a period of time of time. Lots of small meals. I do something similar with my cat. Since she doesn’t eat much she gets fed in the morning and gets wet food(Fancy Feast Classic) on her food between 11:30 AM and 12:00 PM. She usually doesn’t eat it right then but eats it when she’s ready and that usually works out. We also give her an ice cube so she doesn’t eat fast. An ice cube! That’s one I haven’t heard of before! Do you just give it to her before her meal? those are all excellent tips and I have used MANY of them……..Cody is a speed-eater no matter what…..another great treat dispenser for cats that I reviewed years ago is the Bat-a-Rat…….I met the inventor (he lives in Michigan) and to this day, it is Cody’s favorite. I use it every day. As for the Cat-It Maze? Cody knocked it over and got EVERYTHING out that way, he did it in 2 seconds lol. Thank you so much for the recommendation! I’d never heard of the Bat-a-Rat before, but I just Googled it now and it looks AMAZING. Wish it was available on Amazon but will probably order it anyway one day since it just looks so crazy good! About the Catit Food Maze: Avery did that too. Also used to stick his head in the top and eat. The solution to both is to be more tricky than even the most tricky cat: place a really heavy book or two on top of the puzzle so there’s no more knocking it over ;). Problem solved! We’re pretty good about not eating fast, even Sister Gracie eats slow, she just eats any food she can get to, but she’s slow.